Welcome to The SLIM AARONS Collection. GALERIE PRINTS is proud to be working in close partnership with the Hulton Getty Archive and Slim Aarons Archive & Estate – to bring you official Slim Aarons fine art photographic prints from this beautiful collection. With access to the entire Slim Aarons back catalogue of beautiful works, discover this amazing collection for yourself, and what Slim meant as having ‘A Wonderful Time’ . SLIM AARONS worked mainly for society publications, taking pictures of the rich and famous both before and after serving as a photographer for the US military magazine Yank during World War II. His work has been included in the publications Town and Country, Holiday, Venture and LIFE. Aarons was known for the positive portrayals he gave to the people he photographed and was invited to high-society gatherings for exactly this reason. ‘Beauty And The Beast’ 1959. Above, Lady Daphne Cameron (Mrs George Cameron) on a tiger skin rug in the trophy room at socialite Laddie Sanford’s home in Palm Beach, Florida. His subject matter covered American and European society as well as nobility and both minor and major stars of the day. 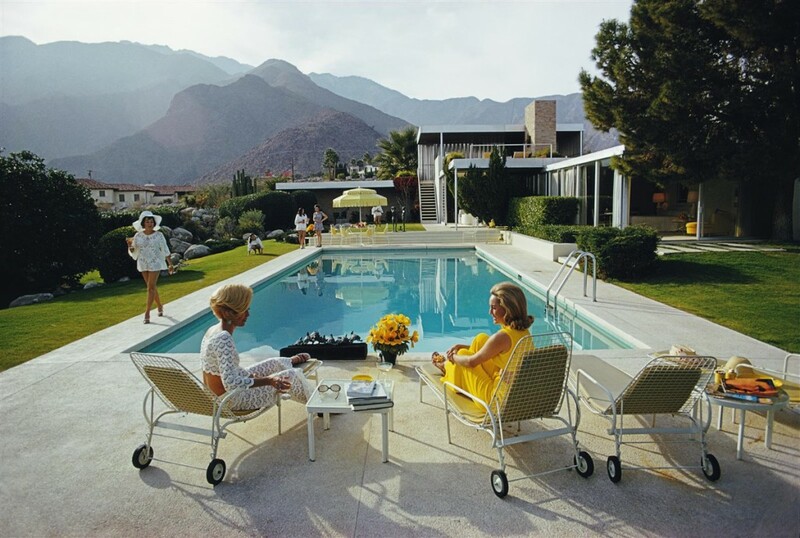 Hi perhaps best known image, ‘Poolside Gossip’ taken in Palm Springs in 1970, is now widely considered a modern masterpiece of photography, effortlessly capturing the style, fashion and material aspirations and affluence of the 1970’s. It features a desert house in Palm Springs designed by Richard Neutra for Edgar J. Kaufmann. Lita Baron approaches on the right Nelda Linsk, wife of art dealer Joseph Linsk who is talking to a friend, Helen Dzo Dzo. Original Artwork publication : A Wonderful Time – Slim Aarons / Hulton Getty Archive. 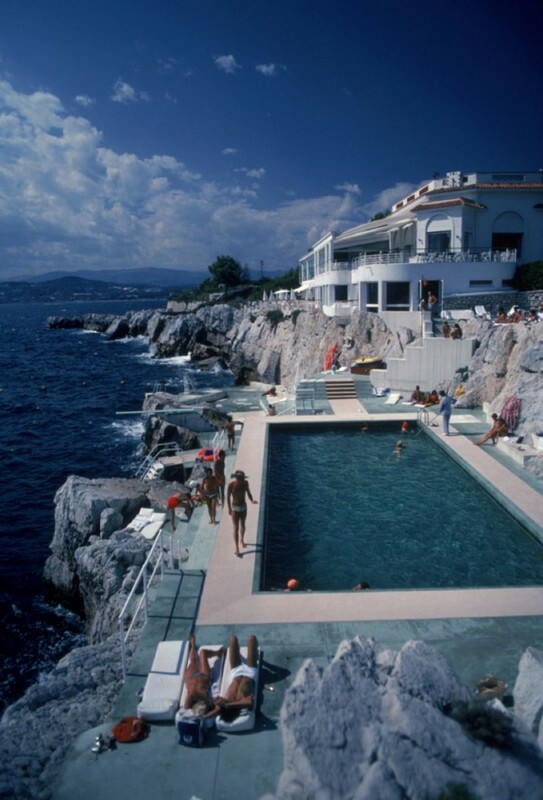 Fast becoming equally iconic is this exquisite image of the luxury ‘Hotel Du Cap Eden Roc’ in Antibes, France. Depicted are guests by the pool at the hotel in August 1976, flanked by the sea with the main hotel building in the background. It epitomizes a care-free holiday atmosphere of a time now past, whilst exuding style and a sophisticated luxury. Slim was famous for photographing “attractive people doing attractive things in attractive places” and this photograph is no exception to this very successful formula. As Slim’s work continues to grow in recognition, the as yet completely mined Archive is being re-visited and new discoveries of his photographs are constantly being made. Galerie Prints are delighted to be able to bring these Slim Aarons classics and ‘new’ works to light for you. Come and immerse yourself in the Slim Aarons Collection. The recently discovered ‘Motorboats In Antibes’ 1969. 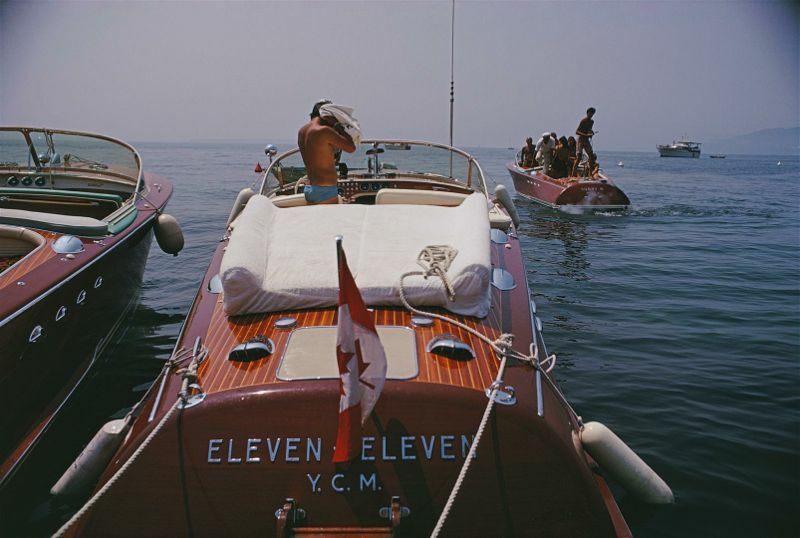 Motorboats moored on the coast near the Hotel du Cap-Eden-Roc in Antibes on the French Riviera, August 1969.